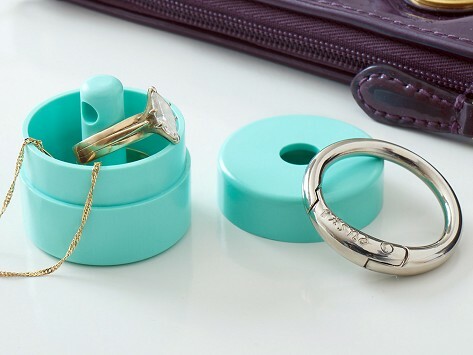 This travel jewelry case is like a little locker that keeps rings, necklaces, and other small items, like pills or hearing aids, secure. The secret is the carabiner-latch hook that locks the lid in place so the holder doesn’t accidentally open. Attach this clever holder to a keychain, bag, or backpack so you can have peace of mind while working out or working with your hands—without your jewelry on. This is great for protecting your valuable rings or other jewelry items and fits great in my purse. I love this item! I wear multiple rings, layered, so when I need to soak my hands each day, it's a problem finding where to safely put them.ly put them. Before this product, that is. One of the rings is wide, so I didn't know if they'd fit, but by turning them so that the stones don't line up, they fit perfectly! Texas-based art teacher, coach, and Lion Latch Maker Lerin Lockwood was always looking for a safe place to store her rings and small jewelry while playing sports or working with paint or clay—which is to say, just about every day. None of the solutions she tried, like putting these pieces in her purse or on a keychain, gave her the peace of mind she craved. After her engagement ring was dented (and the stone was lost!) while catching a softball, Lerin came up with her own solution: a storage locker for the small and special things in her life. Her clever case can attach to a keychain or bag with a carabiner that doubles as its lock. The top can only be opened by removing the carabiner, so it will not accidentally pop off. Now the important stuff stays secure and you can eliminate a little bit of worry from your life.